Has the RAC had a stats breakdown? I’m always on the lookout for uses of stats and data in public relations. This release from the RAC caught my eye. 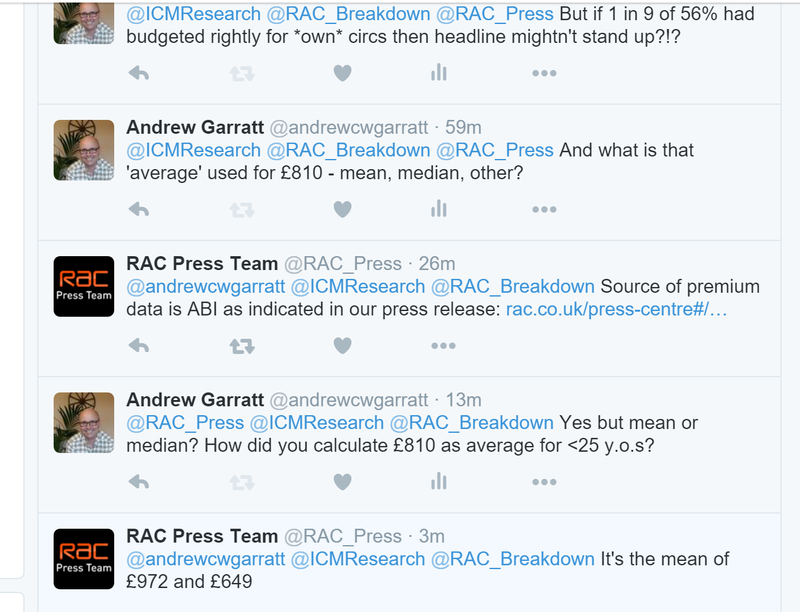 I engaged the RAC press team through Twitter. Let’s look at that average premium calculation in detail. The RAC have sourced statistics on average premiums from the Association of British Insurers (ABI). For policyholders between the ages of 18 and 20, ABI give an average premium of £972. For those between 21 and 25, the figure is £649. The RAC says it took the mean of these two figures. In other words, it’s added £972 and £649 and divided by two. To round numbers of pounds this is, indeed, £810. The calculation is right. But is that the average premium for young drivers under 25? Not necessarily. Indeed, quite likely not. In taking an average of averages, the RAC doesn’t seem to have accounted for the different number of policy holders in the two age groups. Let’s have a closer look. First we’ll use some made-up figures. Say there are 1,000 policy holders between 18 and 20, and 2,000 between 21 and 25. First we work out the total of the premiums paid by everyone in both age groups. The total of all premiums paid by policy holders between 18 and 25 is £972,000 + £1,298,000 = £2,270,000. The mean premium for this age group which has 3,000 policy holders in all is then £2,270,000 ÷ 3,000 = £757. That’s quite a bit different from £810 – the average of the averages. Of course, that’s using some made-up figures for numbers of policy holders. In the absence of such figures we can look at the numbers of drivers in each group. Bear in mind that the older the licence holder the more likely they are to be an active driver and have an insurance policy in their own right. So, in total, there were 1,752,334 licence holders aged 18 to 20, and 3,520,719 licence holders aged 21 to 25. That’s about two licence holders aged 21 to 25 for every one licence holder aged 18 to 20. Let’s say all these licence holders have an insurance policy in their own right, and that they pay a premium equal to the ABI average for their age group. Instead of using our made-up numbers of 1,000 and 2,000, let’s use the numbers of licence holders. A whopping £3,988,215,279 would be being paid by 5,273,053 policy holders. Their mean premium is then the first figure divided by the second or £756. This is a lot lower than the RAC’s claim of £810 as the average for this age group. Now let’s have a look at the other issue – not comparing like with like. The RAC has surveyed young drivers between the ages of 18 and 24. For those aged 18 to 20, their estimates should be compared to the mean premium for their age group, ie £972. For those aged 21 to 24, it should be to £649. And we would need to know what the average estimate is for each of those age groups to make a meaningful comparison. Better still we shouldn’t be looking at the mean estimate as the average but rather the median – the value that lies in the middle of all the estimates. This is because policy holders who are charged a lot more per year will skew the mean average upwards. Say, six people pay £750 a year and a seventh pays £2,000 – the mean of their premiums is £929, a lot higher than six of the seven and so not a good estimate of a typical figure. The median would be £750 – in line with six of the seven. Finally, it’s not clear if those surveyed were asked to give estimates freely or forced to make a choice based on the banding that the RAC reports. If it’s the latter that makes it even more difficult to make comparisons. I emailed the RAC about this last week but not yet had a response. I will update if I get a reply. Next Next post: PR and Big Data – let’s hear it for the Datum!